So Sunday was the Husband’s birthday. Of course when I told the Big One that it was daddy’s birthday, she got very excited. As all three-year-olds know, birthdays mean cake. So she was just over the moon because we would be having cake. I told her we would make some cupcakes. You see the Husband is not a real big cake fan, he prefers cake batter. YUK! I know, but that’s what he likes. So I figured we would make one pan of cupcakes and then save the rest of the batter for him to snack on later. We were all still upstairs just kind of hanging out in our bed when the whole cake conversation took place. 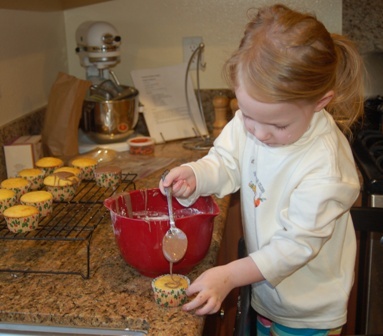 Once we decided we would make cupcakes and I explained to the Big One that mommy was going to take a shower before we started baking, she decided that she had a plan of her own. “WAIT! I need to go downstairs and get the balloons and party hats ready,” she exclaimed suddenly. The Husband and I exchanged worried glances and I asked her if we had any party hats downstairs. I knew we had some balloons because I had just bought some, but the hats I was not so sure about. Again, though to a three-year-old no birthday is complete without party hats and balloons. “Silly mommy, you just have to use your imagination like Barney says,” she told me. So there we were with our imaginary party hats and balloons while we celebrated the Husband’s birthday with cupcakes. Too bad we didn’t use imaginary frosting on our cupcakes. The Husband has figured it out. Frosting is my nemesis. I can cook, bake, roast and steam with the best of them. But man I cannot make frosting to save my own life. The recipe I tried this time was terrible. It was simply powdered sugar, milk and unsweetened chocolate. Sounds like frosting is supposed to be made, huh? I just cannot get the proportions right and it ends up a big mess. It was so bad that I just gave up and let the Big One take over. She dumped half the bag of powdered sugar in the bag, stirred it a bit and called it done. “Just like Grammy makes,” she said. Oh how I wish it tasted like Grammy’s. It was bad, just plain bad. But the Big One and Little One devoured their cupcakes covered in sugary goo and thought all was good in the world. I do cake decorating but I hate making frosting! If I have a fancy cake to do, I’ll often visit my local Safeway and buy a couple of pounds of buttercream frosting from their bakery. Yeah, it’s cheating, but it so works!! !